Earlier this year I joined classicist Natalie Haynes to discuss Dido, Queen of Carthage on Radio 3’s Free Thinking. 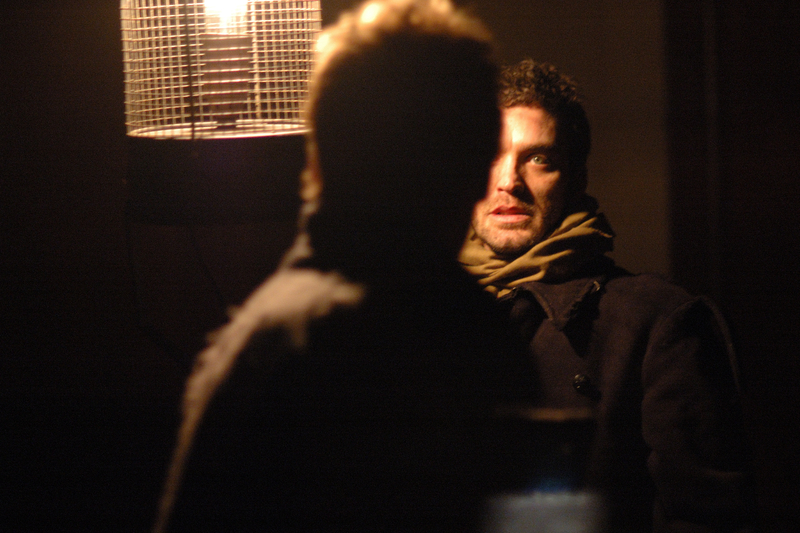 My productions, as angels in the architecture, of the play were the first professional productions, and it was my first creative encounter with a ‘lost text’. Its been an important play for me to work with, through it I began my exploration of site-specific working of lost or forgotten plays. The RSC’s production this year see the play become part of the living repertoire in British theatre, an ongoing ripple effect I think of my company’s work with this text. In 2008 I directed ‘angels in the architecture”s 2nd version of Dido, Queen of Carthage, at Kensington Palace in London, working with Historic Royal Palaces on their first project of this kind inside the Palace. 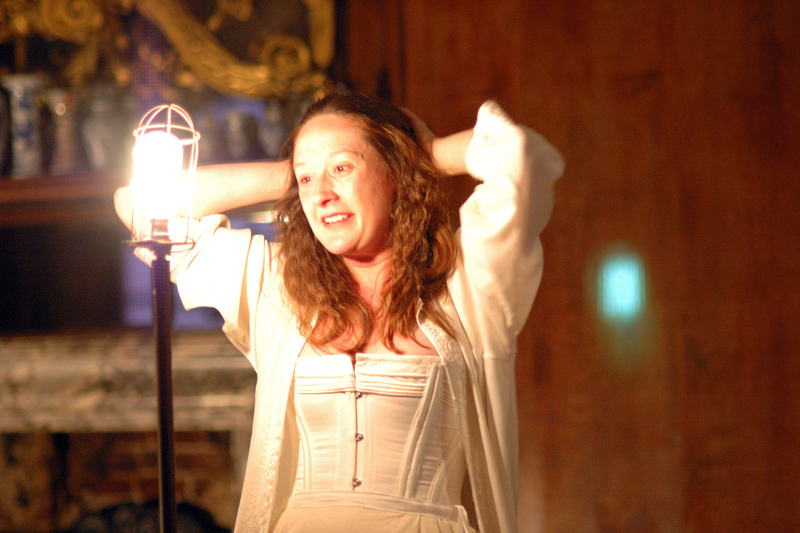 This project led on directly from the success of the production in 2006, at St Barnabas in Soho, with Sarah Thom again playing Dido, and funded again by the Arts Council. This production was ‘angels in the architecture”s largest scale production to date, reaching a wider audience than we had previously reached, and attracting major press coverage as well as being featured on BBC Radio 4’s “Women’s Hour”. Working on the site of the palace influenced our work enormously, with the past and present lives of the Palace informing our interpretation of the play, the design, characters and the structure of the piece. The palace’s afterhours atmosphere and its hidden stairways and corridors, as well as the magnificent state apartment, surrounded by epic paintings and views across London, all contributed to the ways in which both the performers and the audience engaged with the play, which is one of Christopher Marlowe’s least known works. This, Christopher Marlowe’s first play, adds the playwright’s typical vigour to the tale of Dido’s doomed love for Aeneas. With this production, by the site-specific company Angels in the Architecture, the piece gains an extra dimension. The co-directors, Rebecca McCutcheon and Sarah Thom, have struck gold, or rather gilt, in staging Dido’s story here; home, we are reminded, to a later sequence of royal women, Victoria, Diana et al. But historical aptitude is less important than the synergy between the play and its set, and luckily it delivers. In fact, there are sets, plural, since we are taken through nearly a dozen galleries and chambers, most accounting for only one scene. The audience rarely sit down; and the cast face the tough challenge of holding their attention (and the tension) as they lead them along. But Thom, who also plays a haunting Dido, is a linchpin, and the production is full of sharp details. A wonderful idea, boldly executed. One of the great thing about my job is it takes you to places you wouldn’t otherwise dream of visiting. The vaults under London Bridge station, an abandoned document depository in Wapping, and a deserted village on Salisbury Plain used by the Army for target practice are just a few of the locations I’ve trekked to in recent years for so called “site-specific” theatre events. However, Kensington Palace is undoubtedly my poshest address yet, and what a superb setting the slightly fusty State apartments make for this ambitious production of Christopher Marlowe’s rarely performed Dido, Queen of Carthage, which he may have written while still a schoolboy in the 1580s. Closely based on Books I, II and IV of Virgil’s Aeneid, with which so many generations of schoolchildren have struggled, the play already reveals early intimations of Marlowe’s famous “mighty line” – not least with a trial run of the words “make me immortal with a kiss” that he subsequently used in Doctor Faustus. Much of the drama is set in Dido’s palace, so the venue could hardly be more appropriate, especially since Kensington Palace has long been favoured by royal women. Mary of Orange, Queen Anne and Queen Victoria (who learnt of her accession here) all called this place home. More recently, of course, Diana, Princess of Wales lived here, whose story eerily echoes Dido’s, in that she, too, was betrayed by the man she loved. The audience assemble in the entrance hall and then descend a staircase to the basement realm of the disputatious classical gods, who are to play a mischievous role in the play’s action. Intriguingly, the gods – Jupiter, Juno and Venus – are in modern dress, and resemble museum attendants with their laminated identity cards. The mortals, in contrast, favour more antique fashions. Once the gods have quarrelled, it’s up another, splendidly painted staircase to the State apartments designed by Wren, Hawksmoor, Vanbrugh and William Kent. The Banquet Hall becomes the location of Dido’s feast for Aeneas, newly escaped from the horrors of the fall of Troy, the superb cupola room, with its monumental clock and gold-leafed classical statuary, becomes the cave where Dido and Aeneas take shelter from the storm during a hunt – and finally get off with each other. The show, directed by Rebecca McCutcheon and presented by Angels in the Architecture (the intriguing name comes from a Paul Simon lyric), is infinitely better than the ineffably silly production at Shakespeare’s Globe a few years ago, and has some inspired touches. Aeneas’s son is initially represented by a puppet in a sailor suit, but is then spectacularly transformed into an extremely lubricious real-life Cupid, hilariously played by Jeremy Legat. 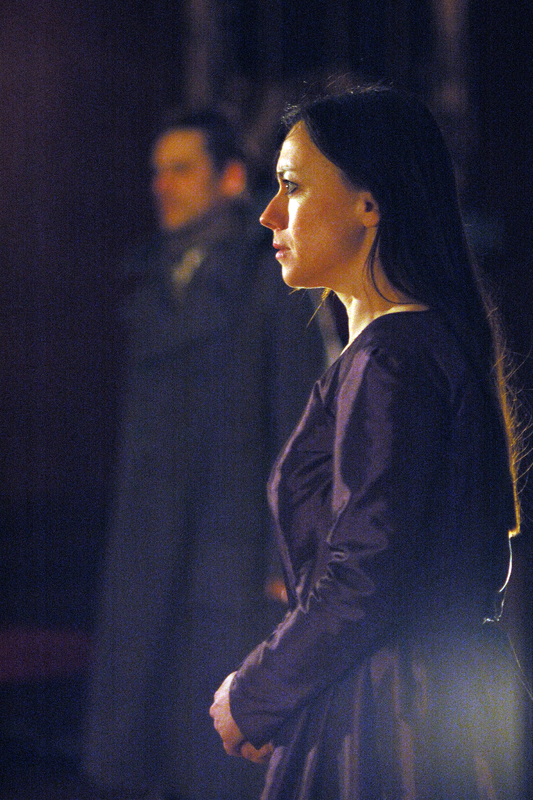 Sarah Thom, meanwhile, gives a sensational performance as Dido, thrillingly capturing both her physical desire for Aeneas (Jake Maskall) and her desolate sense of abandonment when he leaves her. This is a lucid, often enthralling staging of a play that could easily seem as dry as dust. And the spectacular location seems more like an added bonus rather than the entire raison d’être. After toying with settings including a 19th century women’s refuge and the site of the Rose Theatre, site-specific company Angels in the Architecture have finally found a venue that brings Marlowe’s neglected classic to life. The state apartments at Kensington Palace ring with the histories of troubled female royals down the years, from Mary II to Princess Diana, providing a haunting backdrop for this tale of a Queen destroyed by love – especially when filled with much swaying lamplight and watery sound effects. When Dido invites the shipwrecked Trojan, Aeneas, to dine with her at Carthage, she does so in a bona fide royal banqueting hall, with the audience invited among the guests, while Cupid’s cruel love games are overlooked by painted Gods and cherubs, who seem to be egging him on from the ceiling. Sarah Thom handles Dido’s transformation from sombre monarch to giddy lover exquisitely, with Jeremy Legat’s winged troublemaker lending suitably ticklish support. Her subsequent outpouring of grief and anger, when Jupiter calls Aeneas away to his destiny in Rome, feels truly earth-shattering. The production instils a chilling sense of the potentially destructive power of love, even if the audience has to undertake a promenade odyssey to rival The Aeneid to experience it. I recently saw Dido Queen of Carthage at thought it was electric! Thank you so much. The performance was absolutely astounding and left me mesmorised and completely speechless. Please continue forever to do the amazing work that you all do and I am sure to see you at your next venture. Thank you for a wonderful evening at Kensington Palace.I consider myself extremely fortunate to have witnessed such a brilliant and unusual production. Congratulations to all concerned. Fantastic! Great use of space, great acting and a really good evening. Last night’s performance of “Dido, Queen of Carthage” at Kensington Palace was a most wonderful experience .Thank heavens for the Sunday Times review, without which I’d never have noticed it was on. You now have a huge admirer, and I’m telling everyone. Thank you for a totally brilliant experience at Kensington Palace on Saturday night. I took my eleven year old daughter, Ella, who loved it. We became Carthaginian lords and Trojan warriors. I really appreciated the little touches like the silhouettes in the window which we watched on our arrival and kept turning around to look at as we walked down the avenue away from the palace. I’m so pleased you did Marlowe. Please keep reviving Shakespeare’s contemporaries. Thank you. Such a professional production and in wonderful surroundings! The cast were brilliant, as was the staging, lighting and music – the whole evening couldn’t be faulted in the slightest! thanks. I hope you find your disused shop for your next show! Categories: Dido at Kensington Palace, Site Specific | Tags: Dido at Kensington Palace | Permalink.